This resource features the general description of a location in the pseudo-physical manifestation of an elder brain’s oneiric collective. 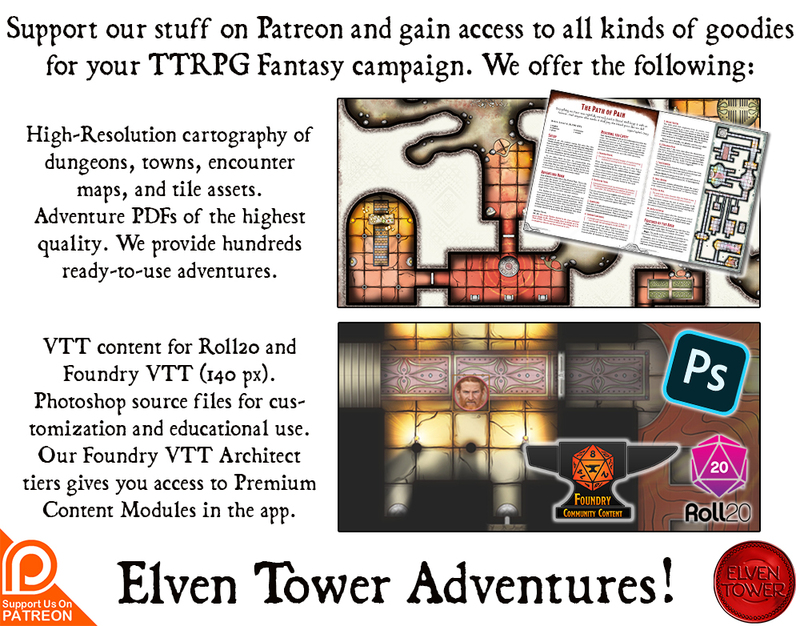 It includes adventure ideas that are appropriate for mid-level (Levels 1 to 5) adventur­ing parties. Challenge Rating (CR) is calculated using a party of four as the model. If there is one evil that must be purged from this land, it is not the orcs, the brigands and the petty criminals. Nor is it the dark creatures from below, necromancers, or evil dragons. The real evil that scourges the lands of men are the wealthy oligarchy members of the elite. Absolute power has corrupted them absolutely, there is no end or limit to their wishes and depravities. With so much control over the way the cities work, and no one there to stop them or even find out what they do, it is the innocent men and women who suffer under the invisible yoke of class discrimination. One example of such excesses is a secret location known as the Red Pit. This underground palace of cruelty and depravity is located under the market district. Its presence is unknown to the thousands of cityfolk that pass over it every day. The authors behind such an idea are four councilmen. The four of them, through their contacts and influence, control the city. Other members of the council are aware that the four prime members enjoy a state of total impunity but refuse to talk or act in fear of retribution. There is no higher power to appeal to, and many other councilmen have disappeared in the dark of night after openly opposing any of the four leaders. The Red Pit first started as a way to deliver swift justice to petty criminals. The prisoners would be brought down to a makeshift courtroom where a rigged trial would take place. One of the four councilmen would take the place of the judge but the sentence was already decided. A mere formality after which the prisoner would be disposed of. As time passed, the councilmen saw that this method of swift justice was cleaned and almost invisible. They would also dispose of their own enemies or unwanted fellows in the city as they saw fit. These sentences grew in number and frequency. Cell rooms and a large cage were added to the complex to hold prisoners for longer periods of time, outside of the usual city cells above. The councilmen decided that it was good practice that once a person was brought down here, there was no way the person would leave alive. A death sentence was guaranteed to any poor souls in the complex. Since prisoners’ lives were forfeit and they would never be seen again in the surface, this was the trigger for the councilmen’s most deranged ideas. A torture room was added near the judgment room. It served no purpose since the sentence was predetermined, it was only for the amusement of whoever presided the torture. But the largest addition to the complex was the Red Pit itself. An underground fighting pit. The Red Pit is a 25 feet diameter arena with 40-feet-tall walls. The walls are lined with spikes to deter any attempts of climbing it. Three barred gates at the bottom of the pits connect it to other locations. A large balcony with four stone chairs oversees the scene. The four councilmen come often to enjoy all kinds of fighting events. The prisoners would not die swift deaths anymore. They decided that was a waste of good entertainment. They would fight each other to death, with proper or improvised weapons. Sometimes they would fight armed champions or terrible creatures brought from above. Two curved benches serve as seats for some carefully selected friends. Any audience is warned that just a single word of what happens in the Red Pit is enough to enrage the four councilmen. Talking about the happening in the Red Pit is a sure way to join the fighters in the pit very soon. These stairs lead up to a hidden trapdoor beside the city barracks. When enemies of the council or prisoners no one will miss are captured, they are brought down through this entrance. A portcullis protects this entrance at the bottom of the stairs. The trapdoor at street level is unlocked but there is a guard posted there all the time. The poor prisoners are brought here from a cell in Area 15 or Area 12. A judge appears from Area 4 and sits on the stone throne. This is just a perverse formality which invariably ends up with the person being sentenced to fight for his freedom in the pit, or sentenced to die in the torture room. There are two manholes that connect to the sewers. A passive Perception score of 16 or higher reveals the presence of the secret door on the north wall to Area 4. Blotches of dried blood stain the floor of this chamber. Countless people have lost their lives in this dreadful place. 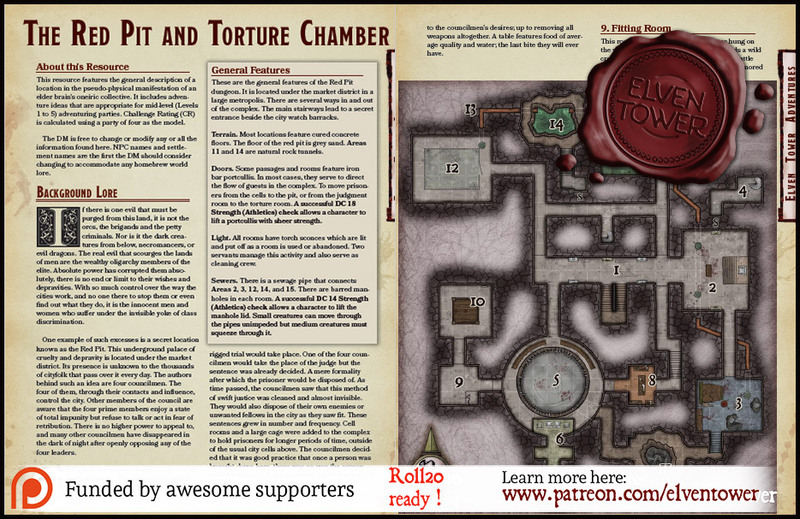 The chamber contains a rack, two iron maidens, and a wooden table with torture implements. There is one manhole that connects to the sewers. The spiral staircase leads to a luxury house owned by one of the four councilmen. Only they have access to the house, which is only used for that purpose. A button on the wall activates a series of gears and pulleys that slide a section of the wall sideways to open the way to Area 2. The floor of the fighting pit is fine gray sand. It absorbs blood as it is spilled during battle events. The walls are 40-feet-high and lined with spikes and needles. Being forced against the wall causes 1d6 (4) piercing damage. Three barred gates mark access to other underground locations. A successful DC 17 Strength (Athletics) check allows a character to climb the spikes to Area 6. Doing this causes 2d6 (7) piercing damage. Four stone thrones oversee the fighting pit below. The councilmen come here once a week to dispose of a large number of prisoners on the same night. Alcohol runs free, food is exquisite, and the fights below follow the whims and wishes of the four powerful men. They decide who fights who, what weapons are used (or not), and what strange beast is brought when the night climaxes. Two alcoves behind the balcony are used to store food and beverages for the councilmen. In a similar way as in Area 4, the stairs behind the balcony lead up to another luxury home the councilmen own. The house features a garrison of eight elite guards at all times. When a battle event is scheduled, the four councilmen come down to the Red Pit through this entrance and sit on the balcony (Area 6) to see the fights. Before going into the pit to die in glorious battle, prisoners are brought to this chamber to arm themselves with whatever they chose. The caretakers sometimes limit the choice of weaponry according to the councilmen’s desires; up to removing all weapons altogether. A table features food of average quality and water; the last bite they will ever have. This room features a few good weapons hung on the walls and a cage. The cage usually holds a wild creature or monster to be used in the next battle event. Champions get ready to fight poorly armored prisoners in this chamber. A pulley-driven winch connects this chamber to a warehouse on the surface. A group of hired mercenaries brings wild creatures and monster as often as they can and sell them to the councilmen. The creatures are brought down and goaded in Area 9. A successful DC 11 Intelligence check allows a character to operate the winch. A hole on the ground filled with countless corpses from the Red Pit and the torture room. The cleaning crew throws all corpses into the pit. The smell in this area is so pungent that any creature entering the room must make a suc­cessful DC 12 Constitution saving throw to avoid becoming poisoned for one hour. If a creature succeeds, it is immune to this effect for 24 hours. This chamber is used to hold a large number of prisoners in the same cage. Usually, only people deemed non-dangerous are held here as the risk of them escaping is negligible. High profile prisoners are held in Area 15. A sewage drain pipe connects several areas in the underground complex. The pipes are small enough that medium-sized creatures need to squeeze through crawling. Each time the party travels through the pipes, there is a 30% chance a large volume of water flushes down in the direction of Area 14. Each creature must make a suc­cessful DC 14 Strength saving throw to avoid being pulled all the way back to Area 14. The sewage from the underground complex and a small section of the market district above ends up in this underground well. The water is not drinkable. A water elemental ends up consuming and liquefying all solid elements that wind up here. A short stairway leads up to a dead end. A button on the wall activates a series of gears and pulleys that slide a section of the wall sideways to open the way to a passage parallel to Area 1. Nine private cells in this room. High profile prisoners and known warriors are held individually in these cells before they are subject to trial and sentence. A successful DC 16 Dexterity (Thieves Tools) check allows a character to open a cell from the inside. If the character lacks Thieves Tools the roll is made with disadvantage. 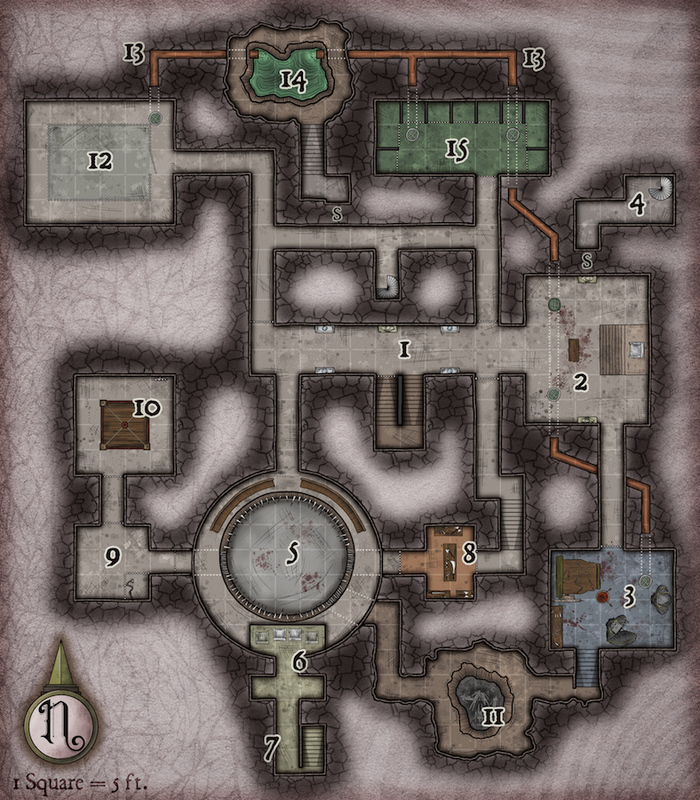 These are the general features of the Red Pit dungeon. It is located under the market district in a large metropolis. There are several ways in and out of the complex. The main stairways lead to a secret entrance beside the city watch barracks. Terrain. Most locations feature cured concrete floors. The floor of the red pit is grey sand. Areas 11 and 14 are natural rock tunnels. Doors. Some passages and rooms feature iron bar portcullis. In most cases, they serve to direct the flow of guests in the complex. To move prisoners from the cells to the pit, or from the judgment room to the torture room. A successful DC 18 Strength (Athletics) check allows a character to lift a portcullis with sheer strength. Light. All rooms have torch sconces which are lit and put off as a room is used or abandoned. Two servants manage this activity and also serve as cleaning crew. Sewers. There is a sewage pipe that connects Areas 2, 3, 12, 14, and 15. There are barred manholes in each room. A successful DC 14 Strength (Athletics) check allows a character to lift the manhole lid. Small creatures can move through the pipes unimpeded but medium creatures must squeeze through it.